Proxychains – A step to anonymity so that you don’t leave your trails and authorities don’t run after you. Kali Linux or any other Linux of you choice and TOR will help us become anonymous. Start your Kali Linux Operating System. Check if TOR is running by the commands above. Now we need to configure the proxychains file in /etc/proxychains.conf . 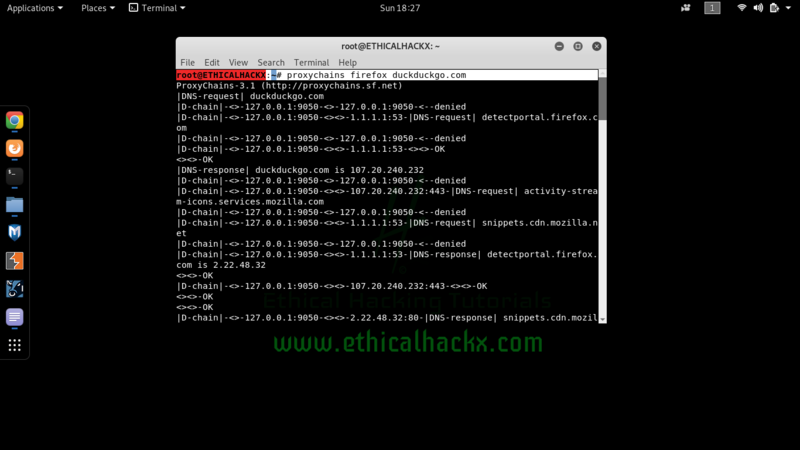 In Terminal or by file manager or any way edit the mentioned file. Edit the File to enable Dynamic Chains and comment out Strict chains. We will later discuss what are these. Enable Dynamic Chains and Remove the hash in front. Enable Proxy Chains for DNS Request, if you don’t you can easily still be traced , so this is very important you enable DNS Requests to be behind proxy as well. Now comes the Proxies, we will use the TOR proxy which we installed in first step. you can use the choice of your proxy be it SOCKS 4 or SOCKS5 or whatever you want, we will be here using TOR, which runs on port 9050. Edit the file like below and save this and close. Here in the DNS address type the DNS you like to use, I would use Cloudflare 1.1.1.1 , you may chose any, Open dns or google DNS 8.8.8.8 , you choice, by the way clouflare DNS is really working excellent on all the fronts, my suggestion. After editing Save the file. We are done with the setup part now lets check. I will just post a pic here to show it’s working. And restart TOR and check status if running. Restarted tor and see the location changed again. This was brief and setting up proxychains. We will discuss more into this thing to make it real though to be tracked and cover more details, there are multiple ways to track a user and we will cover each one of them in upcoming articles, I will try updating the article later. Next articleWhich is Best for an MSP?